Yes, I’m back from an imposed hiatus involving stitches, Advil and plenty of rest. Nothing too serious, but annoying and damned inconvenient. It is said that truth is stranger than fiction and Toronto author Robert Rotenberg turned that out with his fourth novel Stranglehold released in May of this year. The story line features Hap Charlton, a rather large guy running for mayor who is a part-time volunteer rugby coach in Scarborough and if elected, is going to clean up the city. Rotenberg often states that it’s his job to talk about what is going on in Toronto and certainly we can think of a Toronto public figure that is currently in the news these days. Rotenberg’s past work: Old City Hall (2009), The Guilty Plea, and Stray Bullets (2012) like Stranglehold feature Detective Ari Greene hard on the case. I’ve only read his first book Old City Hall but quite liked it and posted a review of the book yesterday. Take an hour and drive to the Burlington area where the Mesdames of Mayhem invite you to a live theatre performance of Murder by the Book by Mat Kelly and presented by the Village Theatre Waterdown. Several of the Mesdames will be at the show with their own little book of murder ‘Thirteen‘ – crime stories from several award-winning CWC members. 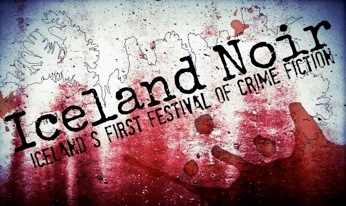 Iceland’s first ever crime fiction festival began yesterday and wraps-up this Sunday. It features special guest of honour Arnaldur Indridason (Iceland’s leading crime novelist) and winner of the CWA Gold Dagger in 2005 and double winner of the Glass Key award for the best Nordic crime novel. The event will also include: Ann Cleeves, JØrn Lier Horst, Micheal Ridpath, Óttar M. NorÐfjÖrÐ and numerous other authors, crime critics and crime fiction authorities. For someone who loves crime fiction as much as I do, it’s marvelous to see all these different world events celebrating authors of the genre. I hope a delightful weekend is ahead for you. Sorry to hear about your enforced hiatus, June. Hope all is well now. All is well Vicki, thanks!